I read a particularly disturbing article about a police chase in Louisiana this morning that continues to highlight the changing nature of police departments around our country. And this comes after a particularly rough summer where police abuses have been highlighted. This story is perhaps the worst of all. It is set in rural Louisiana where apparently police involved in a car chase fired a number of bullets into a car earlier this week. According to one account, they fired 18 bullets into the SUV. 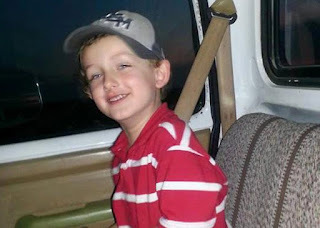 At least 6 of those shots struck and killed 6 year old Jeremy Mardis who was strapped into his seat. The driver of the vehicle, Jeremy's father, was unarmed and survived. The police allege that were attempting to apprehend the driver because of warrants which have not materialized. Two officers have been charged with 2nd degree murder. The tragedy? This story has not made the national news except as an afterthought. This comes after another young man was killed a few weeks ago after his car broke down along I-95 near Jupiter, Florida. And it comes after a summer of unrest around the country about the aggressive, shoot-first and ask questions later approach to law enforcement that is being employed. This is not the 1930's with gangsters riding around the country laying trails of death and destruction behind them robbing banks and using automatic weapons. Innocent bystanders are being killed by direct fire! I remember that, in olden times, the police were the servants of the people. When someone strayed, they packed the person up and took them home. An encounter with the police was not a life threatening event. Look at old TV shows how the police are portrayed--they lived in the neighborhoods they protected and knew the people. The police helped people and only addressed the most egregious violations. We, apparently, have become a society intolerant of even the most minor transgression and the result has been the militarization of the police forces which have transformed them from being servants of the populace to being the enforcers first. I fear the abuses will continue.